Well it is time for another challenge at Stamp and Create w/ Magnolia. 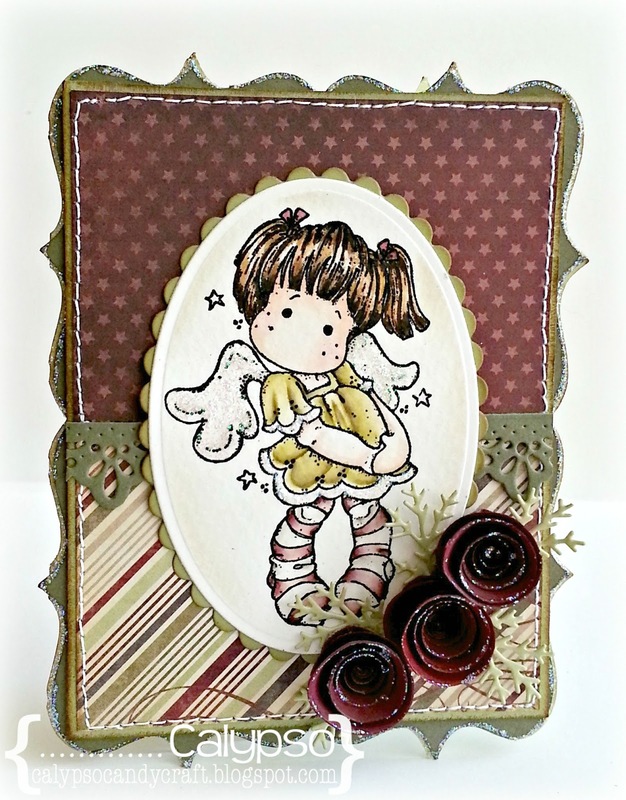 For my card today, I am using Dancing with Stars Tilda, which I have colored with my distress inks and markers. I am really loving coloring my images, especially my Magnolias in this medium. I have used MME: Lost & Found Christmas for my background paper. Added tons of Stardust the edge of the card base, Tilda's wings and the rolled flowers. Crystal glitter glue the trim of her dress. The base of the card was created/cut using my Silhouette. Hope you aren't blinded by all the bling but, I do love the way it all looks. So I am feeling quite cheeky with myself. So grab your Magnolia's, your favorite Magnolia Christmas stamp and join us!! This is a really sweet card I love this image of Tilda great colours design papers and added embellishments especially your flowers. 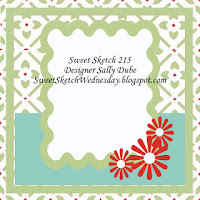 Great card and thanks so much for joining us this week over at Sweet Sketch Wednesday and good luck. Such a sweet, sweet card. Great flowers and love your coloring. Thanks for joining us. Oh my goodness, how totally adorable! Such a sweet image and wonderful flower embellies. Love it. Thanks for joining us this week at Sweet Sketch Wednesday. What an amazing card. I love those flowers and the added stitching. Your card is adorable. Thanks for joining us. Beautifully done card. Thanks for entering the Eureka! Stamps Challenge this week. Very, very pretty! Love those pretty roses! Thanks so much for joining us this week at Sweet Sketch Wednesday. Awww, so very sweet!! Love the added stitching - love the dies you have used!! Beautiful!! What a darling image. I envy the way you color hair!! Great job. Thanks joining our Celebrate with Glittery Bling and Sparkly Things at Delightful Challenges. Adorable card! I think I'm going to be getting myself some distress markers:) Thanks for playing with us at Digital Delights by Louby Loo. Thank you for sharing with us at SSW this week.